Growing environmental, ethical, and social concerns have pushed many, from Beyonce to Bill Gates, to look for alternatives to eating meat. Amid a media storm last August, a 5-ounce in vitro beef burger, made using stem cells from slaughterhouse scraps, was sampled by a team of three tasters in London. People for the Ethical Treatment of Animals declared in a statement that "in vitro technology will spell the end of lorries full of cows and chickens, abattoirs and factory farming," and that "it will reduce carbon emissions, conserve water and make the food supply safer." The fact is that it took more than five years and millions of dollars of research to be able to produce a single burger worth around 250,000 euros, which was said to taste a bit dry and lack flavor. The cost alone highlights a hindrance with this technology. It suggests that it is not a viable short-term solution to fast-depleting resources and land degradation caused by unsustainable agricultural practices. According to Mark Post, one of the main scientists working on the project, it probably will take 10 more years before artificial meat is commercially available. According to Lisette Kreischer, a Dutch foodie, known for her vegan cookbooks, the answer lies elsewhere. She is the ambassador and creator of the Dutch Weed Burger. 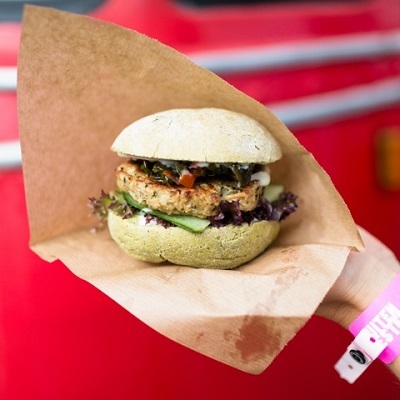 This burger is not only vegan, but it is made of seaweed: a superfood rich in minerals, vitamins, omega 3 and protein that is more digestible than common plant protein. Even the bun incorporates seaweed, and the dressing is made with wakame, a type of seaweed popular in Japanese and Korean cuisine. By making plant-based food more attractive, available and accessible, Kreischer and the team behind the Dutch Weed Burger argue that a food revolution is foreseeable. Kreischer claims that the in-vitro burger is not a real solution to the problem of a growing middle class demanding increasing amounts of meat, as "people will just keep on wanting to eat meat, without changing their way of thinking.� In the eyes of Kreischer, to change people's views on eating meat, the benefits of adopting a plant-based diet, whether environmental or health related, need to be better explained to the public. This is one of the two main challenges to achieving a more sustainable food system, according to the Dutch foodie. The other is to make plant-based food more attractive by making it more available and accessible. To tackle these challenges and the stereotype of vegan food as bland and tasteless, Kreischer and her partner, documentary film-maker Mark Kulsdom, headed to New York, the symbolic heart of a profoundly meat-loving America, to make a documentary on the topic. The team wanted to explore and taste what vegan restaurants had to offer in terms of innovative ways to integrate seaweed into various dishes. Above all, they visited New York vegan restaurants for inspiration, of which several have become successful in changing the image of plant-based food to something scrumptious, attracting mostly a crowd of omnivores. The Dutch pair wanted to create a product in itself, not just a meat substitute. Following their experience in the Big Apple the idea of the Dutch Weed Burger emerged as an alternative to the burger, something that even "non-vegans wouldn't be able to resist," Kreischer said. "Changing people's food habits takes about two generations" Kulsdom said in the film, "but it is a process that can be accelerated when new and better foods are introduced that make it easier to adapt to a new way of eating." To source their seaweed, the Dutch Weed Burger team have joined with scientist Willem Brandenburg from Wageningen University in the Netherlands. The scientist has been exploring the potential of seaweed and algae as sustainable superfoods for the future. Brandenburg believes seaweed cultivation, otherwise known as "seagriculture," is the answer to the problems of increasing water scarcity and land degradation. The biosaline agriculture specialist sees sea farms as a potential and sustainable way of producing food, because they don't require fresh water. Moreover the protein content of some types of seaweed is sometimes as high as 25 percent and of exceptionally high quality." Pilot trials have been carried out in the Eastern Scheldt estuary in the Netherlands to examine the possibility of sustainably cultivating seaweed on a larger scale. The greatest environmental impact of the cultivation of seaweed could be the effect it might have in helping to restore the oceans. In fact, cultivating seaweed could help recover nutrients. For example, a sea farm at the mouth of a river could purify the water by stopping large amount of phosphate - commonly used as fertiliser - before it is discharged in the ocean, acting as a bio-filter. Producing seaweed doesn't require extra arable land, because it grows rapidly in the sea. A team of scientists led by Brandenburg is hoping that in the future, countries will be able to secure their own off-shore seaweed farms, creating a local supply of the superfood. The Dutch Weed Burger is now available in several restaurants in the Netherlands.